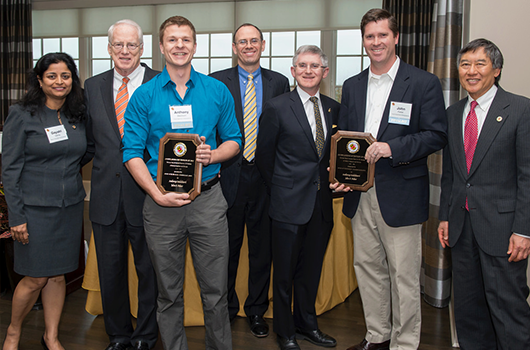 Each year a panel of University of Maryland personnel and industry experts selects one winner from groups of finalists covering for each of three categories: information science, life science, and physical science. 2014 Innovation of the Year winners Professor of Bioengineering John P. Fisher and graduate student Anthony Melchiorri for developing a better material for 3D printing of vascular implants. During the spring semester, UMD's Office of Technology Commercialization hosts the Invention of the Year Reception to honor university inventors and inventions from the previous year. Clark School of Engineering faculty, researchers, and students are regular recipients in the three invention categories.